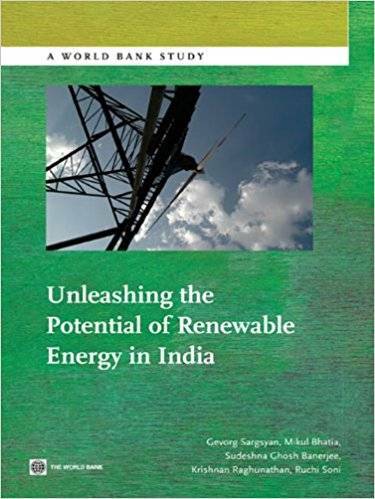 Gevorg Sargsyan, Mikul Bhatia, Sudeshna Ghosh Banerjee, "Unleashing the Potential of Renewable Energy in India"
India has 150GW of renewable energy potential, about half in the form of small hydropower, biomass, and wind and half in solar, cogeneration, and waste-to-energy. Developing renewable energy can help India increase its energy security, reduce the adverse impacts on the local environment, lower its carbon intensity, contribute to more balanced regional development, and realize its aspirations for leadership in high-technology industries. This study aims to answers critical questions on why renewable energy development is relevant in Indian context, on how much development is economically feasible, and on what needs to be done to realize the potential. The Report is based on data from nearly 180 wind, biomass, and small hydropower projects in 20 states, as well as information from the Ministry of New and Renewable Energy (MNRE) and the Central Electricity Regulatory Commission (CERC). The Report suggests that about 3GW of renewable energy – all from small hydropower is conomically feasible, when the avoided cost of coal-based generation of Rs 3.08/kWh is considered. About 59GW of renewable energy in wind, biomass, and small hydropower is available at less than Rs 5/kWh. The entire cumulative capacity of 68GW in these three technologies can be harnessed at less than Rs 6/kWh. About 62GW―90 percent of cumulative renewable capacity in wind, biomass, and small hydropower―is economically feasible when the environmental premiums on coal are brought into consideration. Realizing the need to bridge this gap, the government has set an ambitious target of installing at least 40GW of additional capacity of renewables in the next 10 years. India has made tremendous strides in establishing overarching policy framework and institutions to bring renewable in the mainstream of energy mix, but significant financial, infrastructure and regulatory barriers to renewable energy development remain which the report sheds light on and suggests possible solutions.